Children's Literature at Cambridge: So...what has the royal wedding got to do with children's literature? So...what has the royal wedding got to do with children's literature? So...what has the royal wedding got to do with children's literature? Well, the initial instinctive answer surely has to be not a lot, as Maria Tatar concluded in her own blog this week, drawing the obvious parallels between such an occasion and the world of the fairy tale. I would suggest, however, that if we are prepared to delve a little deeper from the surface then the events of Friday 29th April 2011 bear more resemblence to our subject ( and my own field of study in particular) than we might be first prepared to believe. The first connection is undeniably one of 'witnessing and exploring', two terms taken (ironically) from Maria Tatar's Enchanted Hunters. A million people would not have thronged the streets and parks surrounding Westminster Abbey and Buckingham Palace if they were indifferent to what was occurring. Similarly, the estimated two and a half billion watching the day's events unfold around the world would merely have switched off at the earliest opportunity if they didn't have some measure of interest in the nuptials of William and Catherine (or, the Duke and Duchess of Cambridge to afford them their correct title). Tatar cites the French sociologist Pierre Bourdieu arguing that a popular aesthetic (which is also to be found in the plots of children's literature) reveals "a deep-rooted demand for participation...the desire to enter into the game, identifying with the characters' joys and sufferings, worrying about their fate, espousing their hopes and ideals, living their life" (2009: 19). The assembled masses, both in London and around the world, are a testament to such a desire to not just observe, but to participate in some way in the lives of those more directly involved. This is no different to what occurred when, as child readers, we entered the world of a book so completely that what happened to each of the characters became of paramount importance within our own concerns (although the ability to share the thoughts of the protagonists as we often can in the pages of a book does not, obviously, exist in real life). The very public existence of the major members of the royal family in this country, and members of the celebrity clan, means that many share an empathy with them as absorbing and deep as that shared with favourite (childhood) literary characters. The very fact that they appear to be a very grounded couple deeply in love with one another is just an added bonus. The second connection is one that is more personal to me, but is probably shared in some form by others who read with a voracious appetite when young: that of aspiration and wonderment (terms again 'borrowed' from Tatar). 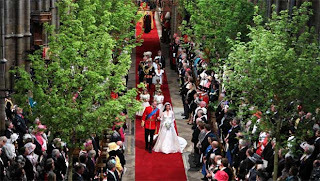 The very moment that the opening chords of Parry's I Was Glad swept over the nation and (the then) Catherine Middleton began her steady walk down the aisle, I was once again the impressionable girl lost in the story. The story for me was one not actually published for young readers, belonging instead to Ewers' copora of hidden or forbidden children' reading (2009:19), but one which was still loved dearly by me in my adolescence, Sharon Penman's Here be Dragons. The novel tells the fictionalised history of Joanna ('real' history has her named slightly differently as Joan), the consort of Llewelyn ab Iorwerth (Llewelyn the Great), the first 'Prince of Wales'. Joanna/Joan was the illegitimate daughter of King John who was, despite popular opinion of the time, accepted into the royal household and married off to a prince when she came of age. Although their marriage started as a political union, they fell deeply in love and, as we would hope for William and Catherine, remained devoted to each other for the remainder of their lives, leading Wales through a period of stability enhaced through their partnership as 'heads of state'. It was the timeless tale of an 'ordinary' girl marrying the prince and Friday's union was its distant echo in modern times. As my own studies relate directly with how we are shaped by the books that we read, the possibility of extending reading to that which we view through visual media affords me the question here of how much younger viewers watching Friday's wedding on television might have been influenced by what they saw. With its trees and cascading flora decorations, the wedding took on an almost fantastical air, evoking Arthurian romance or a Tolkienesque sense of wonder. Added to that the powerful emotions of the music and the floating beauty of the dress, then how many girls began to aspire to emulate such an occasion when they grow up - indeed the speed with which copycat dresses will appear on the high street suggests that such aspirations are not the sole confine of childhood. As the poet Dana Gioia suggests "Some books, people, or places hardly matter, others change our lives, and still others plant some idea or sentiment that influences our futures" (2005:27). 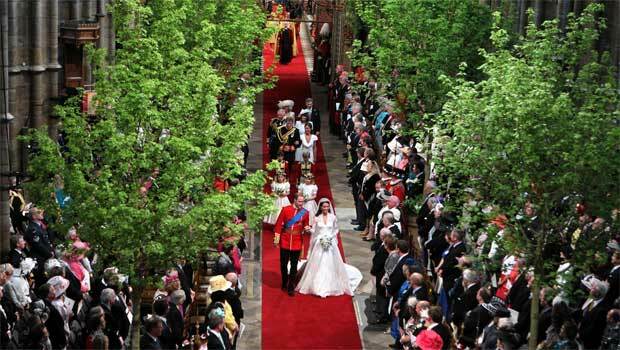 For some, the wedding of Prince William and Catherine Middleton was one such event.